Kreuzberg, Treptow, Prenzlauer Berg. Who would have thought back in 2010 that these districts would become the most expensive and trendy places in all of Berlin? Back then, the world of real estate was clearly structured, with post-Second World War condos in Kurfürstendamm and Unter den Linden or villas in Dahlem and Grunewald attracting the greatest demand. These were the neighbourhoods that were highly sought after and, as such, ranked among the most expensive. Now, however, the market has changed. In the seven years since we founded David Borck Immobiliengesellschaft in Berlin, the German capital has registered approximately 250,000 new inhabitants. And, without the census break caused by statistics, it would even amount to as many as 400,000. Further, the number of tourists visiting the capital has almost doubled since 2006. In 2015 alone, more than 180,000 people moved to Berlin, while 141,000 left the city. According to estimates, another 500,000 inhabitants are to be expected to move to Berlin by 2035. This influx of new inhabitants has seen Berlin experience a huge economic boom, with many new Berliners taking highly qualified positions and earning good money. Accordingly, the number of top earners in Berlin has doubled since 2005. Also, due to the international background of many of the capital’s newcomers, Berlin has attracted interest from a number of international real estate investors. Beside the classic favourites Mitte and Charlottenburg, the international melting pot of Kreuzberg has become particularly popular. Here, we are already distributing beautiful condos in the NeuHouse project, which is located opposite the Jewish Museum. 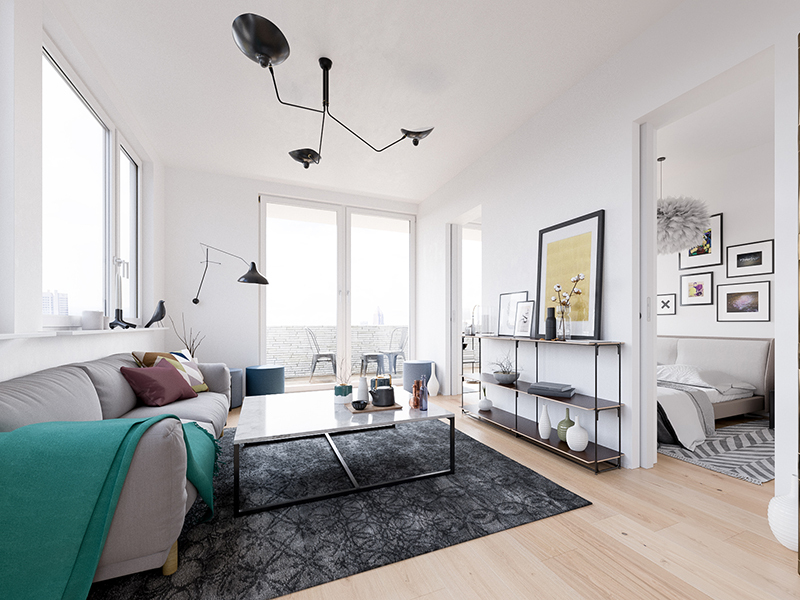 The development combines the advantages of a landmarked pre-war building in the heart of one of Berlin’s most popular districts with the comfort of a new build. It’s little surprise, therefore, that we are experiencing tremendous demand in this area, especially from people in the creative and digital scene, who can afford to buy a condominium and don’t want to leave the district. Kreuzberg also has a great standing with tourists thanks to its many restaurants, bars and cultural sites. There is no other metropolis that combines such a choice of excellently renovated apartments – dating back as far as 1847 – with a new, modern construction in such an affordable area. These apartments offer beautiful stucco ceilings and modern layouts designed by renowned architects Gewers Pudewill. It’s safe to say that Berlin is becoming more and more international. As the population evolves, so does the gastronomy, culture, education and real estate sector, with the latter adopting new international standards to meet changing demands. Concierge services and underground parking have become the norms at the higher end of the market. Furthermore, the increasingly flexible lifestyle of the capital’s inhabitants has established a trend of compact floor plans. The NeuHouse project fulfils all of these demands, while our Nano project boasts proximity to the Spree River, Treptower Park and Plänterwald, which is home to a further 68 micro apartments. Current statistics reinforce our view that efficient floor plans are indeed trending: the floor area of newly constructed condos in Berlin dropped from 99.2sq m to 86.4sq m between 2012 and 2015. And, while we probably won’t get to the Parisian conditions of 22sq m per capita (even our nano condos are between 35 and 48sq m), the ‘rentability’ and resale value of compact condos is simply better than their larger alternatives. Despite all this growth, we’re still miles away from the prices recorded in New York, where a 46sq m studio can cost in the region of $2.5m (€2.13m). That said, almost every industry commentator expects the rising population figures and economic development will have a positive impact on Berlin’s property prices. Here at David Borck Immobiliengesellschaft, our aim is to match potential homeowners with the best neighbourhoods and housing projects, helping them to overcome the complexities of a demanding market to find a home that meets both their expectations and income requirements.